The first thing we know about the old tile floor on display through May at The Frost Art Museum is that we don’t know much about it. Was this mosaic – unearthed by chance after 1,700 years during road work in Lod, Israel, in 1996 – the ground floor of a grand Roman estate? Who lived here? Who made it? What was it used for? We can only look across the fantastic scenes of wild animals, schools of fish and exotic birds they left behind, and wonder. Why are there no sailors on the decks of the ships sailing these seas of limestone tesserae? Why do the leopards, lions and tigers tear at the antelopes, goats and donkeys in some bloody scenes but appear to lie down with them peacefully in others? Why is there scant human presence at all, save for a single footprint – perhaps left by a construction worker when the floor bedding was soft and new? And, for anyone who has ever lived with a tile floor or shower stall or backsplash – or picked up the Home issue of a magazine – we can only wonder, how did they clean that floor? “Probably just water and sponges,” says Jordana Pomeroy, the director of the museum on the campus of Florida International University in Miami. Which leaves us to wonder who took care of this 50-foot-long-by-27-foot-wide floor? It probably needed some. There are wine urns – called kraters – depicted in the tiles here, evidence the occupants entertained well and lavishly. But there are no wine stains on this floor, no scuff marks, no sign the bacchanal ever, well, kratered. Surely, so long before modern steamers, cleaners and sealants, there had to be staff involved in the upkeep, right? Wine stains are not going to remove themselves. And the grout? Forget about it. Who’s going down on their marrow bones and cleaning all that? We don’t know. (We’re just glad we’re not). We can only stand around the edges of this wonder of the ancient world, and wonder. We Keatses, pondering the mysteries of our urn. It’s hard to say who will be most interested in seeing the Lod Mosaic here, the last stop – and a coup for FIU – on a world tour that has included The Louvre, The Metropolitan Museum of Art and The State Hermitage Museum. Anyone interested in history, yes. Art, yes. Antiques Roadshow, definitely. “We’ve heard from a lot of designers and design groups here who want to come in and see it,” Pomeroy says. Which means we may soon be seeing scenes once portrayed on the floors of grand Roman estates on our own floors, shower stalls and backsplashes. I can picture the schools of fish glistening up an elegant South Florida kitchen or bath, for example. The wine kraters? Perfect behind a bar. There are dolphins depicted in the ancient tiles, too; and, while not exactly trademark infringement, they look close enough to the Dolphins’ logo to repeat in tile for a rec or media room. Some day in our far future, someone may excavate our floors and wonder. Who lived here? Who made it? What was it used for? 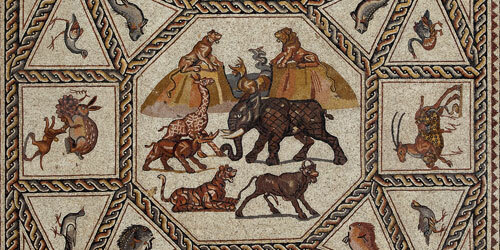 The exhibition Predators and Prey: A Roman Mosaic from Lod, Israel, continues through May 15 at the Patricia & Phillip Frost Art Museum at FIU in Miami, 10975 SW 17th St., Miami, 305-348-2890, thefrost.fiu.edu.